At SIGGRAPH 2017 the lobby is a wash with graffiti. Ghost Paint is a Virtual Reality painting app designed to take advantage of the Vive’s unique features. It allows the users to create art in the most natural way possible and was created entirely with Blueprints in Unreal Engine 4 by Epic Games artist Shane Caudle as a personal project. We spoke to creator Shane Caudle. FXG: How is this different from other VR paint applications ? SC: This originally started with me wanting to use the Vive controller in a different way, both hands holding one controller in a non standard way, similar to the way you would hold a real airbrush. This uses the touchpad to simulate the dual action of a real airbrush. Touching the touchpad causes air to flow, and pulling back on the touchpad causes more paint to come out. I have not seen that done before. And I wanted the ability to use both hands to create art, at the same time, like using the spray can with one hand, and holding a stencil in the other hand. This is really dynamic, as you can be moving both at the same time, or drop the stencil on the canvas. It also supports under-spray, based on how far the stencil is from the surface. You can even paint with both hands at the same time. I really like the mobility of it. 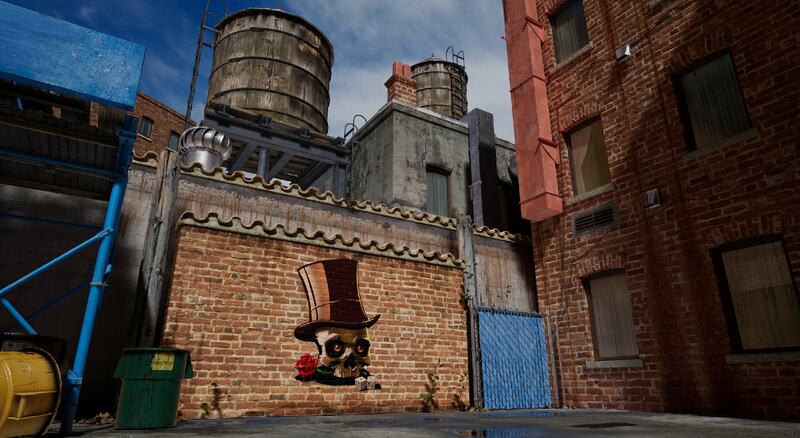 You can use the grips to just grab the world and climb around to paint anywhere you want easily. This lets you paint however you want, you can use room-scale, or just chill in you chair and move the world as needed. FXG: What are some of the cool functions, in addition to the stencils, airbrush and spray paint? SC: You can paint with both hands at the same time. You can move the world around with one hand, while painting with the other. You can do other things too, like change the color with one hand while you paint with the other hand.... Rainbow time! You can have symmetry on while painting with both hands at the same time. Warning - this gets crazy! All the painting tools also support sub-step painting for super smooth paint strokes.You can use the grips to grab the world and move it around with either hand. This is great if you want to paint up high or down low, or just to move yourself around quickly.You can also grip with one had to grab the world, and then grip with the other hand to rotate the world around the first hand. With these two features, you can actually paint very comfortably sitting or standing. FXG: What would you like to do next? SC: I will continue to improve Ghost Paint, as I have lots of idea for other features & modes I would like to add. I have working prototypes of some of them already, like painting strokes in the air, painting on 3D models, as well as painting in the air with arbitrary meshes. FXG: And you this will be at SIGGRAPH in LA, where can people see it? SC: It is in the South Tower Lobby. There will be two large video walls, and some local graffiti artists doing demo's as well as letting the public try it themselves. 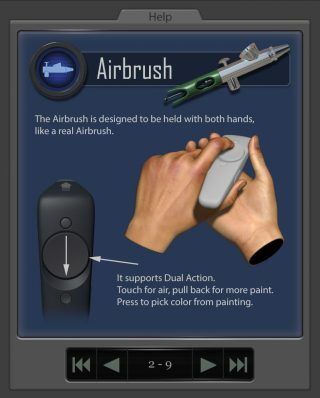 Airbrush - Support full dual action control, like a real airbrush. Spray Can - Allows for nice lines, and shading.Stencil - Can switch between stencils, and scale up and down. Camera - Used to take in world shots that are saved to your hard drive, you can switch between 3 modes. Square 1024x1024, HD 1920x1080, 4K 3840x2160, Images are saved in 16 bit HDR format. Teleport - You can teleport around, and adjust your facing direction with an arrow. UI Grabber - The UI can be placed in the world, or held in your off hand. Undo - 5 levels of undo that cycles. Redo - 5 levels of redo that cycles. Drips - Toggles drips on and off. Mirror - Whatever you paint on one side, is also flipped to the other side. Clear - Resets the canvas back to when you started.Save - Save the raw canvas image in 16 bit HDR format to your hard drive. All the icons have names that pop up when you point to them, this makes it very clear what they do. You can unlock the outer ring of colors by clicking the lock, and set them to whatever you want, and then lock them again. Then just click them to use that color. The ring sets the Hue, and the square set the Saturation and Value. You can also quickly pick colors from the canvas/wall. (There is Help UI under the Options Menu to give you info on all the Controls, Tools, and Action). You start in the 'lobby' level, and from there you can pick what you would like to do. Paint a Canvas Pick what size/aspect you want to paint etc. 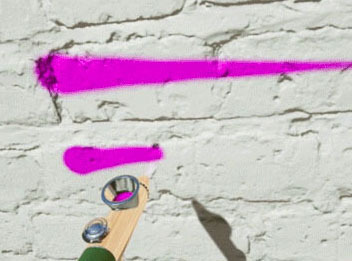 Paint a Wall Pick the location, Back Alley, Underpass etc. Live Installation This mode was is for when doing a live painting exhibition where there is a large screen that the person in VR is painting in front of. 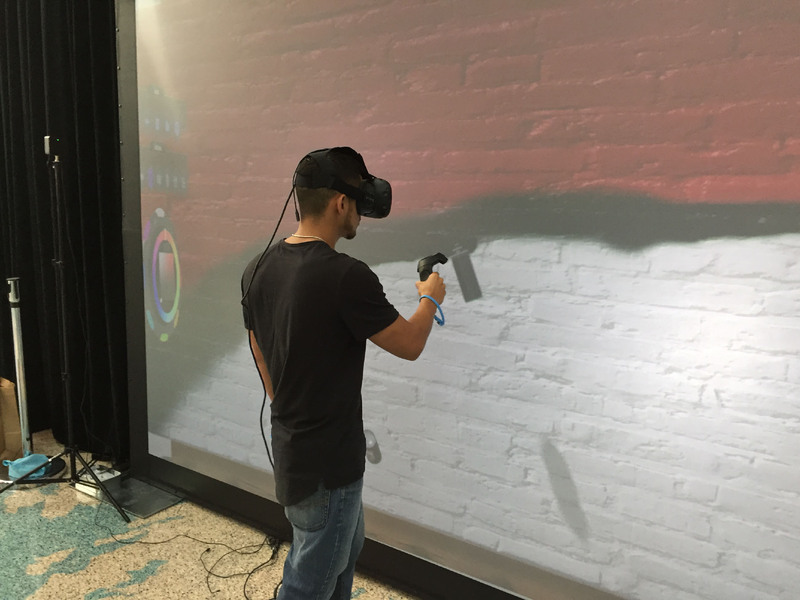 This will simulate a 1 to 1 painting type situation, where to the spectators, it looks like the person in VR is actually painting on the large screen.